Location: Pirdop is situated in Zlatitsa-Pirdop valley along the banks of Pirdop River. 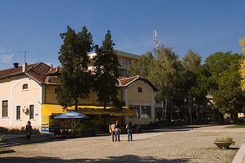 The town is 81 km east of Sofia and 4 km east of Zlatitsa. The magnificent peaks of Central Balkan Mountain range are rising above the town. Pirdop and the mountain slopes are facing south which makes the town one of the sunniest settlements in Bulgaria. During the winter the snow coverage lasts 20 – 30 days and the average temperatures are usually above zero. That makes Pirdop favourable site for calm holiday among the nature. The region offers excellent conditions for hiking, cycling, hunting and fishing. History: The vicinities of Pirdop have been inhabited since the Antiquity. Historians suppose that the lost Thracian town, Bourdapa, is situated near by. There are more than 200 Thracian mounds and several medieval fortresses in the surrounding areas. The town has been known as Pirdop since the 17th century. Its citizens put up hard resistance against the Ottoman invaders. The local ruler Momchil of Pirdop defended Pirdop for a long time. The town took an active part in the national liberation movement too. During the Revival period the town developed into a handcraft centre and it was in economic boom. The braids, vests, homespun frieze, tufted rugs and goat’s rugs, produced in Pirdop were well accepted in the international marked. The spiritual and cultural life in the town didn’t left behind too. In the beginning of 17th century a monastery school in town had already operated. The so called peer counseling began functioning in 1840 and in 1863 the girls’ school opened its doors. The community centre started in 1869. 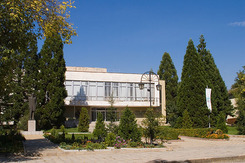 It became a centre of popular education and culture. 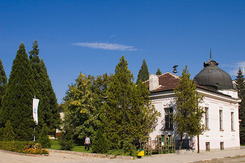 One of the best schools of coping operated in Pirdop for a long time during the Revival period, leaving a lasting trace in Bulgarian literacy life. After the Liberation milk and dairy production developed in Pirdop. Landmarks: Pirdop is a pretty town. Its centre is well arranged with flower gardens and fountains. “The Assumption” church was built in 1819. The wood-carved iconostasis is considered to be a remarkable work of art. Vicinities: Doushantsi dam is about 10 km east of Pirdop. The lovely artificial lake offers perfect conditions for recreation, water sports and fishing. Elenska Basilica is 6 km northeast of the town. The ruins of the temple dates back from Roman time and they are an impressive architectural monument. Pirdop is starting point for hiking routes in Central Balkan Mountain and Sredna Gora Mountain.